Epoxy is a formula made from a mixture of both a resin and a hardener that is commonly used for flooring and other surfaces. 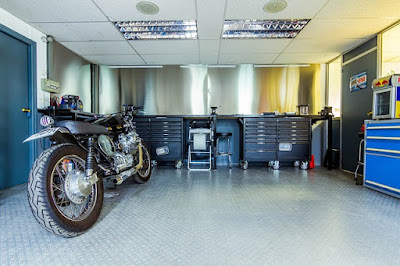 Unlike other popular garage floor finishes like sealants, paints, and stains, you won't need to worry about oil and grease stains, and you can easily clean your floors to help them maintain their original appearance. Here's how to apply epoxy on your own! Concrete that has too much moisture will not work with epoxy, so you will want to perform a moisture test before buying or applying any product. The ASTM-D-4263 Plastic Sheet Test is one way to perform this test. Take time to clean and repair your concrete as well as you can. Clean oil stains by scrubbing floors with a cleaning solution designed for cleaning garage floors and pressure wash the surface. A simply sweep goes a long way as well. Use a concrete mixer and a trowel to fill in any holes, chips, or cracks. Although more expensive, multi-layer coatings are often better quality than one coat varieties. For the best garage floor epoxy, you should invest in a coating that will last longer. You will also need to consider what finish and color you like the best. Epoxy doesn't bond well to smooth concrete, so you will need to roughen up your garage floor to get the right texture. Using a diamond grinder, shotblaster, or acid wash are some of the best options for achieving this result. Follow the instructions on how to mix together the resin and hardener. A good method is to stir the resin before adding any hardener and continuing to stir until completely finished. Lastly, it's time to apply the epoxy to your floors! Use a roller and paintbrush to fully cover your garage. Scatter any color chips after the epoxy is spread.